Experience Reykjavik, one of Europe’s most surprising, welcoming and happening cities and the capital of the ‘Land of Fire and Ice’, on this unforgettable break. Discover the startling Icelandic landscape – of smouldering volcanoes, geysers, glaciers and bubbling thermal pools – and have the chance to witness the enchanting Aurora Borealis. Fly into Iceland’s Keflavik Airport, where our Tour Manager will meet you and a coach will be waiting to carry you to Reykjavik and your first hotel. An included, guided city tour introduces fascinating Reykjavik and its surroundings this morning. See landmarks such as the Presidential Residence and the towering Hallgrim’s Church. 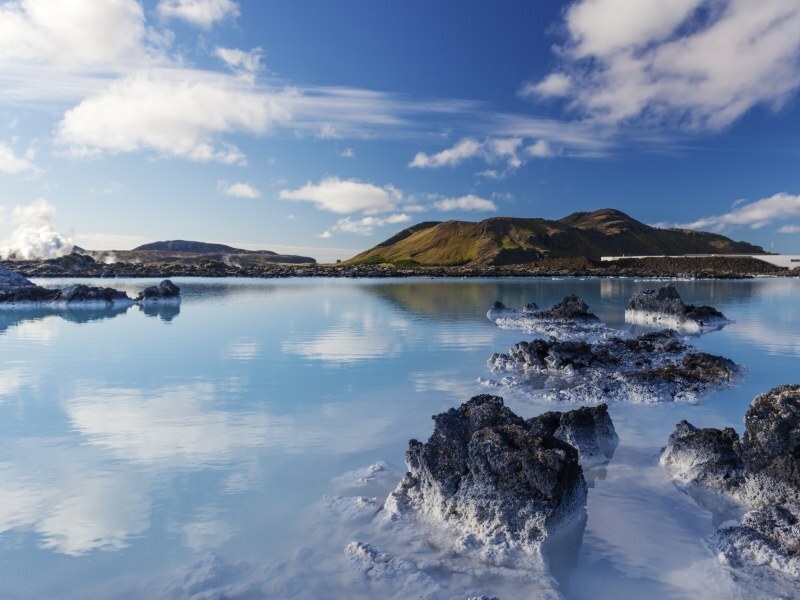 This afternoon, an optional excursion offers the chance to take a dip in the mineral-laden waters of the Blue Lagoon. These warm waters have become one of Iceland’s most recognizable attractions, but began life as a by-product of the nearby geothermal power plant where superheated water rising from the ground near a lava flow is used to drive turbines that generate electricity for the region, and heat the local water supply. On this morning’s optional Golden Circle tour you’ll see Thingvellir – the green expanse where Iceland’s ancient parliament (the Althing) used to meet. Stop beside the (near-extinct) original Geysir and time the gap between the eruptions from the nearby, and far more frequent, Strokkur waterspout, before rounding off your day with a visit to the vast cascade of the Gulfoss waterfall. The highlight of the tour comes this evening, when you’ll head out of the city to search for the Aurora Borealis – the enchanting Northern Lights – flickering in the Icelandic night sky. Should you be lucky enough to see it, the phenomenon is a sight to behold. Explore Reykjavik under your own steam, today, or join our Southern Shore Adventure optional excursion. This journey into wild, rugged Iceland takes us across the lava plateau, down onto the southern coastal lowlands and across the mighty river Olfusa. Discover Eyrarbakki, a coastal village with many old wooden houses, and marvel at Eyjafjallajokull – the volcano that famously closed down European airspace in 2010. We’ll also visit Skogafoss waterfall, the icy wall of Solheimajokull and Vik i Myrdal – the southernmost village in Iceland. After lunch (payable locally) we stop on the black sandy beach at Reynisfjara – famous for its birdlife. Afterwards, enjoy a last evening in the Icelandic capital. Transfer back to Keflavik Airport to board your flight home.